Having half the size and weight of the 4600, the 2004 HP LaserJet 2550LN is a multi-pass color laser printer that still delivers the high-resolution 2400dpi color prints and features of its larger predecessors. Built-in Ethernet allows other computers on a network to take advantage of this color laser printer. When color laser printers were first introduced on the market, they were big, heavy, and expensive. The 2550LN was Hewlett-Packard’s first compact color lasers. 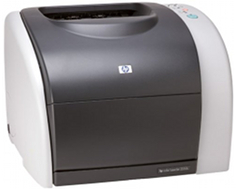 The 2250L has the same footprint as the HP LaserJet 4600 series, but only about half their height and weight. Weighing in at 48 pounds, the printer takes up an 18-by-19 inch footprint in your office. Its 13-inch height makes it taller than many mid-level B & W laser printers. To keep its overall size as small as possible, the LaserJet 2550LN only comes with a multi-purpose flip-out tray that can hold up to125 sheets of legal or letter-size paper. For offices that need a color printer with larger paper handling support, you have a choice of buying a 250-sheet or 500-sheet cassette tray, which can be easily attached under the LaserJet 2550LN. Network-ready, the LaserJet 2550LN also has USB & Parallel ports for direct connection to any computer. The built-in 64MB of printer memory can be expanded up to 192MB, enabling the LaserJet 2550LN to easily handle workloads as a high-volume network office printer. Using a “fuser-on” technology, the LaserJet can go from sleep to print in 15 seconds, making it faster than many B & W lasers. The LaserJet 2550LN can print up to 20 pages per minute using only the black toner. Multi-pass color printing drops the printing of images in color down to 4 pages per minute. To achieve the 2400 x 2400 color resolution the 2550LN offers, HP utilizes a technique where each dot in the native 600 x 600 dpi will have 4 colors. Think of it like having a whole pie then cutting it up into 4 smaller pieces. At the maximum resolution text is reasonably sharp, and photographs are very detailed with smooth color transitions. If you want to print in B&W, the printer software will allow for you to only use the black toner, saving on color toner. The biggest space in color printers gets taken up with the toners and drum assembly. 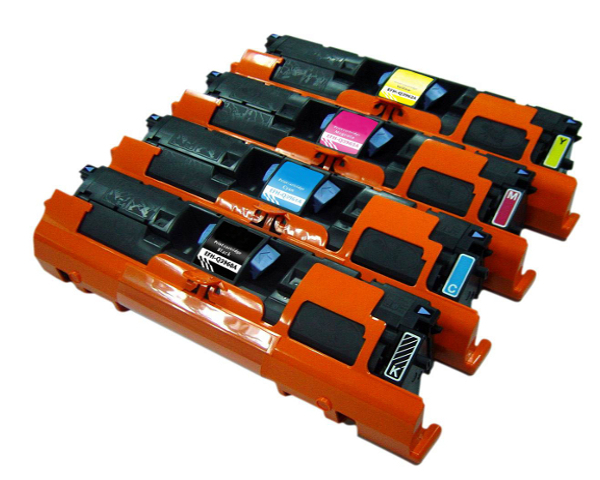 Multi-pass color printing allows for a smaller package at the sacrifice of print speed. While the LaserJet 2550LN can print a single color at 20 pages per minute, to print through all four colors takes over four times as long. The control panel is separated into two sections, one for supplies and one for printer. The Supply section is pretty straightforward and pretty easy to understand. The Print section, on the other hand, is just as vague has all of HP’s “displayless” control panels. You have a “Go” and a “Cancel” button and 3 LED indicator lights. Be ready to brush up on your Morse code skills because the light patterns can mean anything from “I’m out of paper” to “Call Service”. It might be a good idea to print a copy of the error codes and tape it to the side of the printer. This is one printer you don’t want to keep by your desk. Sitting silently idle, the LaserJet 2550LN produces 66db of sound when printing. To give you an idea of what that means: 65 decibels is about the level of loud conversations. If you have a quiet workplace, you don’t want to place this near any office cubicles, but its noise will hardly be noticeable in a copy room or break room. Review it: "HP Color LaserJet 2550Ln "
The LaserJet uses a carousel-style toner assembly to keep the printer’s size small. Pressing the “Rotate Carousel” button on the Control Panel bring each cartridge to the top for servicing. The toners and the separated drum can be easily accessed from the front. Out of the box, HP includes a standard 5,000-page yield black cartridge, and three 2,000-page yield color cartridges, one for each color (Cyan, Yellow, and Magenta). Those print numbers are based on the always asterisked “5% ink coverage per page”. To give you an idea of what that mean’s: a standard business letter uses 5% ink coverage; a newsletter 30%, and a print with graphics, text, and photos can exceed 60%. These “no-shake” cartridges can be purchased separately, especially since the black and yellow toners get depleted at a higher rate than the other colors. Combo-packages are available to save costs. 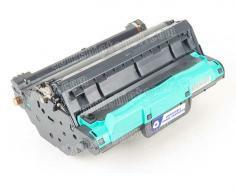 The other consumable you’ll need to consider is replacement of the Imaging drum every 20,000 toner passes. That means it’s good for 20,000 single-color pages, or 5,000 4-color pages.